Signatures of double supermassive black holes have been discovered in a large number of radio galaxies by an international team of scientists, including University of Tasmania physicists. A new research paper, ‘How frequent are close supermassive binary black holes in powerful jet sources?’, was published this week in the Monthly Notices of the Royal Astronomical Society. “Where matter falls into black holes, this sometimes also produces a pair of powerful plasma jets, which burrow through the surrounding gas and can be seen with radio telescopes,” said Dr Stas Shabala, Senior Lecturer in Physics at the University of Tasmania and the study’s co-author. “The jets are narrow and at a much higher pressure than their surroundings, so they expand to form pairs of much wider radio lobes. Together, the whole structure is called a radio galaxy. We understand the physics of radio galaxies quite well, yet the lobe and jet shapes in some objects have puzzled astronomers for a while. The published work presented the first systematic study of a large sample of the brightest radio galaxies. “We were astonished how frequently we found signatures that were compatible with jet precession – this was the case for almost three quarters of our sample,” Dr Shabala said. This surprise finding showed that jet reorientation was the rule rather than the exception. He said the reason double black holes are so frequent among powerful jet systems could be that powerful jets are intimately linked to galaxy mergers. “Galaxies collide and merge with one another from time to time. A prediction of models is that the supermassive black holes located at the centres of these galaxies will also eventually merge,” explained the study’s lead author Dr Martin Krause, a recent University of Tasmania staff member and now Senior Lecturer at the Centre for Astrophysics Research, University of Hertfordshire in the UK. 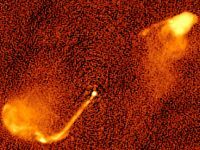 Dr Krause said the merger also causes gas in the galaxy to be drawn into the centre on the same timescale, thus activating one of the supermassive black holes and causing it to produce jets. This idea was discussed for a while in the literature and has received new support by these findings. Dr Shabala believes the quality of the University of Tasmania’s astrophysics research and facilities might be the best-kept secret on campus. “I wonder how many people know that we are the only university in the world operating a continent-wide array of radio telescopes, which we use to both study the sky in exquisite detail and measure the movement of Earth’s tectonic plates to millimetre accuracy?” Dr Shabala said. “I am very lucky with my colleagues in the University of Tasmania Physics discipline, who are all incredibly clever, collegial and supportive – and even fun to work with. We are globally connected, this latest collaboration with the University of Hertfordshire being an excellent example. Pictured: The radio map of the object 3C 334 shows pairs of jets emanating from the bright nucleus. Because of the presence of the second black hole in the nucleus the jets change direction periodically.